This video is hard to watch. It was hard to put together. To shrink a story that can take nearly three hours to tell into a concise ten minutes was a challenge. Therefore, I will begin an open narrative through this site, in the hopes to save someone else from the road we are now having to journey on. Explaining specific moments from this video, the timing of his weight loss, and more. * Humanity in the midst of this horror [and why I don’t HATE the doctors and leaders], and how I am choosing to handle my anger. Why are you not choosing litigation at this point? Why do you think the standard needs to be raised? What does that even mean? What support have you found to uphold your belief that Mike’s cause of death was from medication toxicity? Was he tested for autoimmune/cancer/infectious disease… what “mysterious illnesses” were they looking to find? * I will share what Mike was saying all along. And why I believe that others were not able to see and hear what seemed so obvious to us. * We’ll talk about hydration and the signs of over-toxicity and of the end stages of his life that went unseen and how I believe that can happen. * I’ll share how I received the autopsy report, and the fight for the Toxicology Report. There are huge concerns I have in the standards there, as well as certain drugs and drug families that harm people in alarming numbers. I will tell you how Mike’s passing avoids being in such statistics and why I fear the impact is far beyond those numbers. * I will share what the meetings were like with the leaders, what I had hoped in walking into those meetings, and what I still hope to see happen, even though that door was closed. * People have asked how we were handling Mike’s original symptoms and I will share from that openly as well. * I believe there are messages through Mike’s passing that could teach medical professionals, caregivers, drug companies, patients, and patient families. A doctor held Mike’s hand before she left for her days off [having no belief that it was her last time to speak to him], “Michael, every once in a blue moon, someone comes along like you and teaches us. I want you to know that as hard as this is, we are learning from you.” I want to make sure that that is true — not only for her, but for anyone willing to learn something vital from this tremendous loss. I hope that you will follow along. It may take 11 days of purpose, or it may come to you much faster. I am fitting this into life, as we — like you — are finding joy this Christmas Season. Last year, everything we walked through flooded my mind around the clock. This year, I have a gift now that I can give as we seek ways to raise awareness, and lift one man’s story to impact the greater good. These messages are important to anyone who has ever reacted in reverse to medications. The words are equally vital to anyone who administers meds, uses them, or knows someone who will. In America, that’s all of us. Change cannot happen unless we care enough to care. May this cause you to self-educate, and to care more for your own body’s needs. May it fine-tune your ability to “see” and “hear” those trusting in your care. **You can sign up to receive email notifications when new posts are uploaded. You can also do so through the RSS feed in the footer, and you will be notified via your browser or RSS reader. This leaves me in tears. I’m so so sorry but so very thankful that you are doing this. As I holistically-educated nurse, and a person whose life was dramatically altered by things I learned from Michael Shroyer, I have a ton of curiousity about the physiological details of what happened to him. I also want to know and understand so that I may prevent it happening to any patient I may come into contact with. Love you guys, praying for you, and as always, thank you for your openness. P.S. You’ll then need to confirm via the link you receive in your e-mail. Thank you, Ami, for persevering through this past year and rising up to tell this story, raise awareness, raise the standard, and make it count. You have an army supporting you, believing in you, and sharing your story, too. Since we are surrounded, we rise! Ami, thank you for your story and all you are doing with it. Love you and your ministry. I would love to have the CD.. This video was so well done. Even though I already knew all these details, and attended his memorial to hear everyone who spoke, it brought me to tears. Take your time. Tell his story. Every. One. needs to hear it. Your respectful tone throughout this video..whether referring to medical staff that you had to trust, to questionable procedures and practices, but especially concerning Mike, is another layer that only God could provide. Ami, keep pressing on. This brave stance, not accusatory or anger driven, but for Knowledge and Improved Patient Care, may be the dawn of something remarkable. Prayers as you continue this journey with grace and dignity. Thank you, Allison! I know that if I want to advocate connection and change, it will happen through conversation. And open narrative has no chance through accusation. I know that for 11 days, doctors were working hard within their standard that they had to adhere. They were not coming to work for 11 days concocting best ways to kill Mike Shroyer. I am now quite confident in what actually happened to Mike; and therefore, I am going to tell the details plainly. Hopefully with clarity. And in doing so, my hope is that people with walls of rising defense or pride will be willing to tear them down… and join the changing of the conversation. Everyone — from the most decorated doctor to the wife at home — everyone can raise the standard. I hope people hang in each day, and I will do my best to provide good information. If they didn’t know what was wrong with mike then why were they giving him medications ? I my self have crazy reactions to prescription drugs and I had a family dr tell m many years ago if I ever give you something that makes you feel worse then you did STOP TAKING IT. Unfortunately, any conversation that we attempted to have regarding the medication side effects was not taken seriously by those who mattered in making the change. An attending pulmonologist finally wanted to put the meds on hold, but she left for a few days off, and the other doctor attending during the night shift was in disagreement with her. The meds during the night continued to spiral Mike into those states of shock. It was awful to have no voice to stop it. What finally removed Mike from under that doctor’s care was when the Rapid Response team had to come and rescue Mike from collapse, and rush him to the ICU. We thought for sure that it would change at that point, but the same pattern happened, and the disagreements amidst the doctor teams led to more medications and tests, and not less. I heard from a CNA after Mike died that he stood up for Mike and expressed his opinion. He was removed from our room, and told, “Stop listening to them; you are making it worse.” And we were talked about like we were overreactive and a bit crazy. Thank you for sharing, Ami. What a brave, wonderful thing you are doing for Mike’s memory. He’s still touching lives. People are going to hear you, Ami and it is going to make a difference. I am so glad you have the ability to share Mike’s story this way. As hard as this was to watch I was cheering, Yes! This is what people need to hear. Yes, this is going to change lives. What a blessing this is going to be. Press on—-I agree with you from an earlier post—God is a God of purpose—and there has to be a purpose in all of this.—–Raise the standard—because if the care your husband received was the “highest” level of care—-what is a lower level of care????? Something just isn’t right! Wow…Even though I knew the details, watching the video is heart wrenching. It is amazingly done and will get attention!!! So hard to see him suffer through these pictures and videos. As a nurse I want to scream, as a friend it breaks my heart again to see what you and the kids had to and have to go through each day to rise after this. Ami, this video is just exactly what needs to be out there and I am so glad you had the courage to tell the story. As each of us share the story or video, let us pray for lives to be changed. 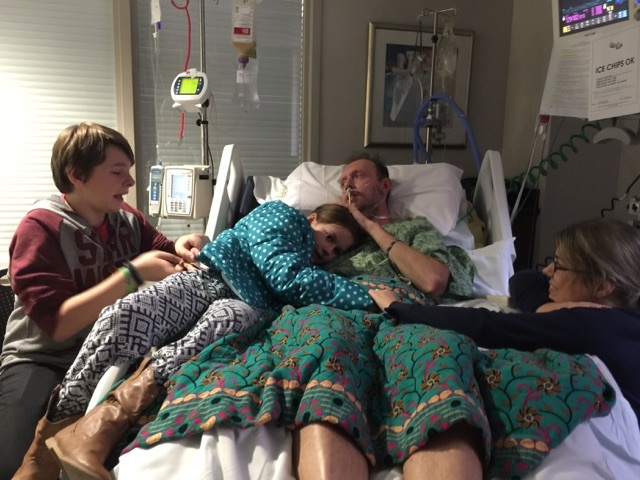 Doctors, nurses, wives, husbands, parents, and others need to see this because it gives a face to a family and to a man who was strong and healthy. We cannot prevent sickness but we can listen, learn, and teach others to care and raise the standard. God bles you and your children as you continue to seek the heart of God and turn all things to goodness. Your grace is from Heaven and your dedication and perseverence are an inspiration. We can do all things through Christ who gives us strength. Continue to shine His light and change the world!! Absolutely in tears. Thank you for being open and allowing me to learn how to advocate for my loved ones! May the Lord bless you. I’m afraid nothing is ever going to change in the medical profession because of their ‘God complex ‘. In the month my husband was in the hospital not one person ever looked at him as a whole person; he was a set of unrelated symptoms. When I finally hit my wall and called them out on it, my exact words were “quit looking at the symptoms and look at him!” But it never happened. Long, long, long story but he’s home now. I am so sorry for your loss. I can’t imagine what you and he went through. I pray God’s strength and wisdom for you. I would love to know your full story someday. God bless you and your family. With great Wisdom. In sickness and in health. So sorry to read this (saw on Heather Robinson Favelo’s timeline). This reminds me of so many things. Conventional drs if you have a friend & ask do not get that much training on pharmacology. Reportedly they get a lot of their info from drug reps. I have heard that pharmacists are much better at knowing the ins & outs of particular drugs. Drs also may be aware of side effects, but not connect patient symptoms w that. We had that w my Dad being on Norvasc bp med. & then having edema so he had to wear compression stockings. This went on for I think 2+ years. Finally heard of a green food supplement which we started him on a very low dose of because he was upper 80s. About a mo later he went to see his dr who said his bp was down & took him off Norvasc. Then w in a short time, the edema went away. When we discussed this w the dr, he said, oh yeah, Norvasc can do that! So he had been aware of that, but did nothing to tell us to switch meds. My Mom developed super bad constipation. So bad that Fleet enemas did not relieve it & she was hospitalized. They ran tests for colon blockage & told her she didn’t have colon cancer. They didn’t really find a reason & sent her home, greatly debilitated at 79. About a mo later, her eyelid wasn’t opening & we thought she had had another minor stroke. We reported it to the dr, who did not get her in for at least a couple days. At that time, I guess maybe he figured it out. He did a spinal tap & found that she had non-Hodgkins lymphoma. They did chemo, but not the very strongest. She lasted exactly 7 weeks from diagnosis. She had also had some hip pain which we thought was related to a fall on the Great Wall of China on a trip months before. I always wondered what the connection was between the severe constitipation & the lymphoma. Finally much later, I decided to look in a book we have from Johns Hopkins, Symptoms & Diseases. You can look up symptoms to see what conditions may be associated w the symptoms & you can look up diseases & see a list of symptoms. Lo & behold, I found that intractable constipation is a complication of lymphoma. But somehow they didn’t put that together when she 1st went in. Would diagnosing her a mo earlier & starting treatment have yielded a different outcome? We don’t know, but it might have. I think that so much is known (by someone, not necessarily the dr treating a particular patient) that they can’t know everything. Also, w so much to cover in med school, a lot of topics apparently don’t get much attention. Seems to me that having a comprehensive online database, w info like in the Johns Hopkins book that drs could input a symptom or serious of symptoms & other info & have the computer come back w possible conditions. I know webbed.com has a consumer version of this but it is not real comprehensive. Trying to have all that is known medically, computerized in searchable databases could be a valuable resource for treating drs. But also conventional medicine just doesn’t seem to know what to do w weird symptoms. So many cases of people w weird symptoms & medical professionals being stumped, but rather than just admit they don’t know, they don’t listen to the patient. & sadly the way modern medicine in practiced, often drs do not know their patients that well to know if he is a complainer, or if he has a high tolerance for pain so a complaint really means something. Other types of health care professionals may be better equipped to recognize & diagnose weird symptoms. I’ve had some that drs just shrugged their shoulders about. Fortunately they were not life threatening. But they did affect quality of life. A naturopath had me tested for “toxic food allergies” (a different type than conventional allergies. One affects iGg & one iGE I think it is. In my case, that showed up some mild sensitivities. When I avoid those things most of the time, I just feel better. I had been having occasional heart flutters or irregular heart beat & would get winded over a brisk walk down a hallway or walking up a flight of stairs. My primary did nothing. My naturopath takes my pulse in both wrists each time. She noted an irregular heart beat & told me to go see my primary. W that word, the primary didn’t find anything (since it took a week & a half to get an appt) but she did run a test & diagnosed fluid retention/mild congestive heart failure & put me on water pills. Point being that conventional drs don’t know what to do w vague symptoms & may conclude they are psychological. But if we are paying attention, we know our bodies & what is different. We need better cooperation between conventional & complementary medicine so that the insights of each can be benefitted from. One medical center that I have become aware of that does this for cancer & lyme disease & some autoimmune issues & maybe other things is envita.com in Scottsdale, AZ. Knowledge is out there, but these days no drs can know everything, but some are more open to the fact that they don’t know or to learn from complementary medicine. & getting a database that has more & more of the known info that medical professionals can refer to could help. I hope this makes sense & complements what you are trying to do. Thank you for sharing! I completely agree; we do need better cooperation between medical and natural modalities. Bridges must be built. Ami, I am so sorry for your loss. There are no words to make it any easier to comprehend how medications that are so toxic are readily given without thought or belief that harm will and can occur. In 2008 I experienced a complete systemic toxic reaction from an antibiotic that I was given. That reaction set into motion a cascade of events that have changed life as I knew it. I have often said that it is a miracle that I am alive. I think the hardest thing to deal with is the fact that the medical profession does not believe you when the only thing that makes sense is that clearly when someone is healthy prior to medication and in a life threatening situation after medication, that medication is the contributing factor. I am so glad you found our fluoroquinolone Facebook groups and I’m sure you will find a wealth of knowledge within the group. Thank you again for your voice. I hear you. Keep advocating, for your healing AND for the awareness and change that this world so desperately needs.